Banana bread with a berrylicious twist! 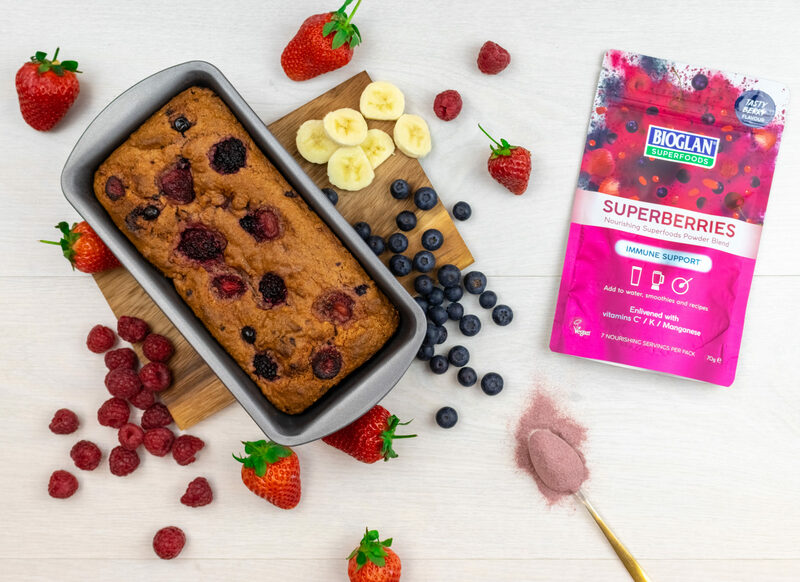 Our Picnic Perfect Berry Bread with Superberries is also vegan and is a lovely addition to the picnic basket now the weather is starting to warm up. Preheat oven to 180 degrees. Grease a loaf pan with coconut oil. In a bowl, whisk together flour, baking soda, salt and Superberries. In a second bowl combine the banana, almond milk (room temp), sugar, vanilla extract and melted coconut oil. Fold wet ingredients into the dry until incorporated. Fold in ½ cup of mixed berries. Save the rest. Pour batter into loaf pan and top with leftover berries. Bake for 45 minutes – 1 hour until you insert a toothpick and it comes out clean.